Sometimes when the heat sets in,it can get discouraging; energy seems in short supply. Even the most loved of gardens seems,well not as lovely as it did. Don’t give in to those thoughts or worse yet actions, such as avoiding your gardening chores. If you grow lemon verbena, you can have a delicious treat at the end of weeding. In fact, this wonderful herb can be a treat every time you walk by it; it smells more like lemon than a lemon. Just in case you do not have lemon verbena in your garden, a few facts to know before you head out to buy one. Lemon verbena is a tender perennial that means it will return year after year, provided it doesn’t freeze to death. It is hardy to about 25 degrees ! In our experience it seems able to tolerate lower temps for brief periods especially if it is carefully mulched in fall. This herb is pretty,pale to medium green pointed leaves,very tiny flowers, but to be honest it is not a beauty. In our herb gardens it will be about 3 to 4 feet tall and tends to sprawl a bit. In ideal growing situations (you already guessed ideal isn’t here) it can reach 15 feet. But lets not let that upset us,it still will be very happy in good well-drained soil and especially if it gets afternoon shade and a reasonable, not excessive amount of water. Lemon verbena is a native of Peru and surrounding countries and wasn’t introduced into Europe until the 18th century–so–no interesting medieval recipes for amazing cures using our herb. That’s not a worry either you will love lemon verbena leaves in your tea. It can be used alone as an herbal tea. This herb has a strong lemon fragrance so it really doesn’t take a great deal to make a delicious difference in your drink. 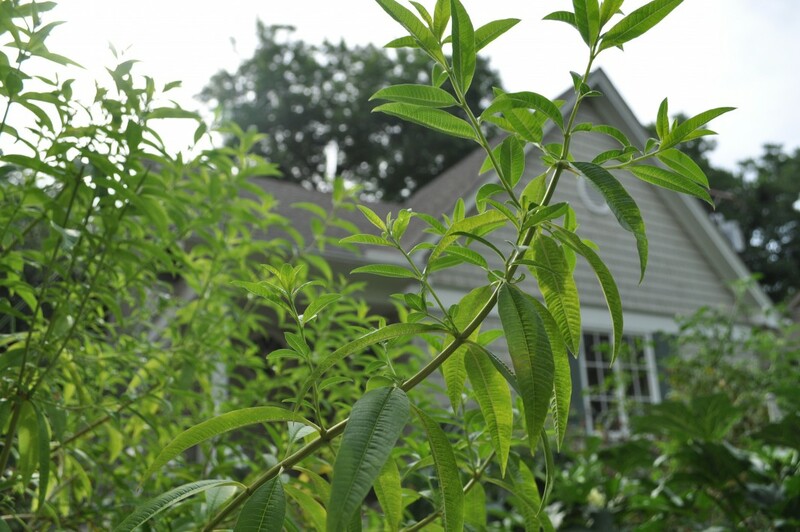 Do not be afraid to experiment here–no known dangers associated with lemon verbena. I find that a small stem of herb(perhaps 6 leaves) and the stem can be added when brewing a pot of tea using one family sized or about 3 regular tea bags let this steep for about 10 minutes then cool and serve over ice you can remove the herb–or one lucky person –that would be you–you grew it after all–can have it in the glass. The same proportions apply to green tea,maybe a bit prettier since the color sets off the color of the herb. Just a few more points–if you are just planting your lemon verbena–no tea for you yet!!! You need to allow the plant to grow a bit before you harvest; but it grows fast. Never over harvest. The plant naturally needs leaves to make its food. Be patient soon you will have plenty. You may consider several plants; once you taste your tea I feel sure this will be the case. This herb is grown from cuttings. The seeds are very difficult to get to grow i’m sorry to say but in spring at least you will be able to find it quite readily in nurseries that sell herbs. As always, never brew tea from herbs that have been sprayed with chemicals. The best time to gather any herb is in the morning. Rinse you lemon verbena briefly in cold water if you feel the need and enjoy!! This herb is one of the best for drying-no special equipment needed- sniping small bunches of leaves and laying them in an out of the way place (a word to the wise–away from any possible interference from cats) just leave to dry and when dry; store airtight. It stays amazingly fragrant so a hot steaming cup of lemony tea will brighten up a cold day which will come one of these days. If you come to visit us at The Demonstration Garden on Joe Field Road, don’t forget to crush a leaf of lemon verbena; you will love it and I hope you also grow your own and put it to good use. It will add joy summer and winter. No calories, no guilt! 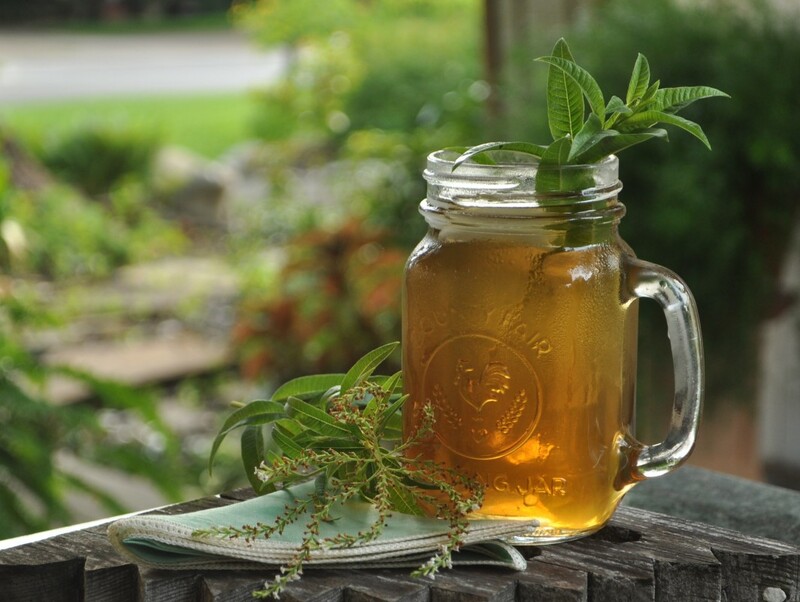 Posted in Herbs To Grow In Dallas, Recipe and tagged Herbal Tea, Herbs to Grow and Use in Dallas, Lemon Verbena. Bookmark the permalink.